225 HP @ 4800 RPM. 262 Cubic Inch partially dressed marine engine. 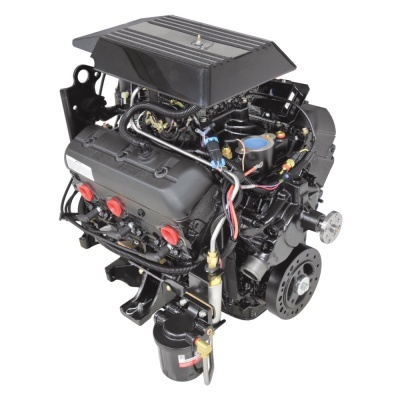 4bbl 600 cfm marine carburettor, high torque aluminium intake manifold with bronze pads and water crossover, electric fuel pump, and aluminium oil pan. It is 100% new construction, and uses cast iron cylinder heads and block, 9.4:1 pistons, and 1.5:1 roller rocker arms. Audio warning horn for overheat, low oil pressure, and low drive lube levels. It uses Thunderbolt ignition with Alpha shift interrupt and 10‑Pin Harness. Engine Installation and Pre-Delivery Inspection Service Available - Contact Us for a Quote.